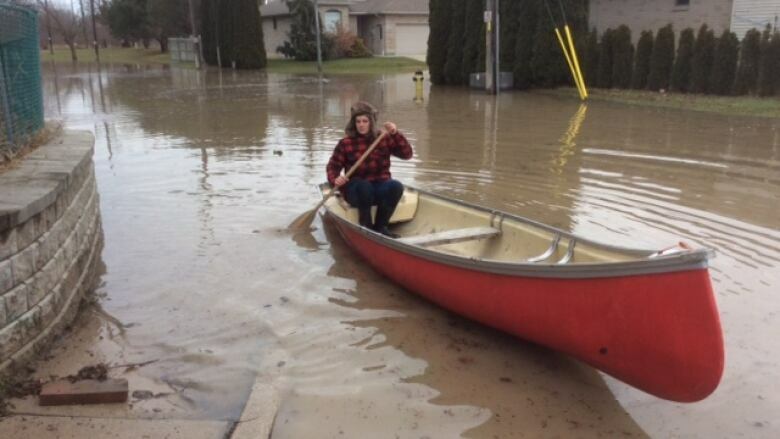 Floodwaters that peaked in Chatham-Kent, Ont., overnight Saturday enveloped streets in the downtown core and prompted first responders to work "around the clock" to rescue people from their flooded homes. Janet Vandariviere was in tears on Sunday, exhausted from the lack of sleep she's experienced over the weekend — staying up each night to monitor the flooding on her property and in her neighbourhood. "It's been hard," she said, surrounded by her neighbours who get frustrated as people drive past barricades on their street to get a better look at the damage. "I wish they'd listen to the officials. You're not supposed to be doing that," she said as a pump tirelessly works to keep water flowing out of her basement. Chatham Street is right beside the Thames River in Chatham, Ont. The river's waters peaked overnight Saturday, prompting first responders to work "around the clock" to rescue people from their flooded homes. 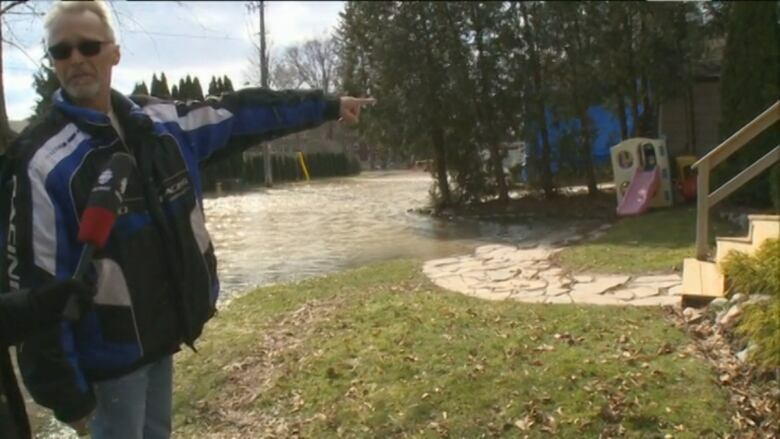 Janet Vandariviere stands in front of her flooded home off of Thames Street in Chatham, Ont. 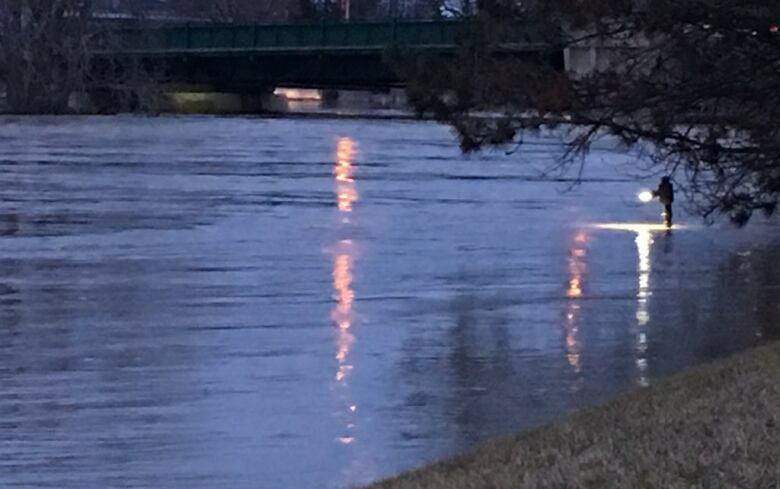 The surge of water started upstream Thursday causing officials to call a state of emergency in Chatham-Kent and Thamesville on Friday. Both municipalities asked people to voluntarily evacuate from their homes. Chatham-Kent Mayor Randy Hope said the decision was made to give the municipality more power to activate emergency services. On Saturday he said the municipality remains in an "emergency response phase" as crews monitor water levels minute to minute. Water levels are five metres higher than normal, and entire streets remain submerged. "The crisis isn't over," said Hope, adding it's unclear when officials will start the "recovery phase" of operations. Officials said sewage is starting to come up in some areas of Chatham-Kent. They are also worried about debris being carried along the river's fast-moving current and where those objects will end up. The extent of the damage is unclear. Minister of Municipal Affairs Bill Mauro is expected to tour the area Monday. "What we need from the province is in the recovery period," said Chatham-Kent fire Chief Bob Crawford. "When we see the water subside, in terms of levels, we will then be working closely with the province to see what we can do for the public." On Saturday, fire crews, dive teams, and EMS rescued about a dozen residents from their flooded properties. Officials warned that those missions would get more difficult during the night and take more time. Some of those who were evacuated live a few doors down from Vandariviere and her neighbour Joe Kielstra. They kept an eye on each others' homes as well as some of their elderly neighbours. "We have a plan and we stick to it," said Vandariviere. Now that water levels have stopped rising and they can protect their basements, they hope that gawkers splashing up water with their cars will avoid their street. "We're trying to take care of our places while they're coming down here to look. That wasn't very pleasant," said Kielstra.